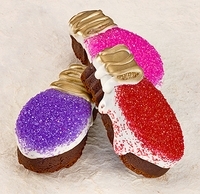 This collection of individually wrapped brownie lights is packaged in a white gift box and tied with a holiday ribbon. Each brownie is dipped in chocolate and decorated with seasonal sanding sugar, sprinkles, or crystals. The perfect gift to light up the holiday season.